John was a street person whom was friends with Emigdio's brother Vidal. He asked Emigdio to paint him. This Limited Edition Giclee is 36 x 24, its original size. There are only 120 high quality canvas prints available including a Certificate of Authenticity. The price is exclusive of any tax, shipping, or frame. John was an Orange Barrio local that was known for freely expressing his religious beliefs. John would hang out in areas that Emigdio frequented and would ask that Emigdio paint his picture. 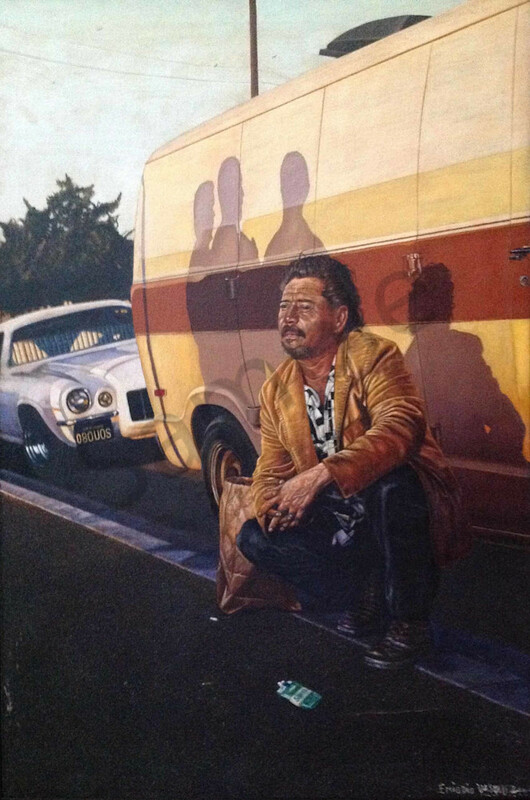 Emigdio both accommodated John's request and made a statement in this work about how homeless people often live in the shadows of others. This Limited Edition Giclee is 36 x 24, its original size. There are only 120 high quality canvas prints available including a Certificate of Authenticity. The price is exclusive of any tax, shipping, or frame. John was a street person whom was friends with Emigdio's brother Vidal. He asked Emigdio to paint him.